Announcement: The management of this farm have informed that this butterfly farm will be closed from 8 March 2015 - 31 Dec 2015. It will be re-open to the public in early 2016. 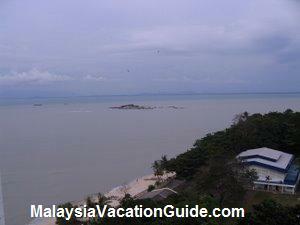 If you have not been to any butterfly farm in Malaysia, this farm at Teluk Bahang is worth visiting. 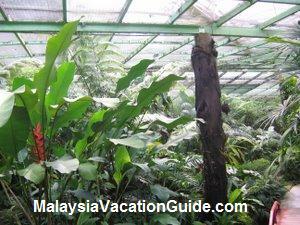 Established in 1986, this is the world's first live tropical butterfly sanctuary with over 4,000 live butterflies from 150 species. The farm is enclosed in a huge netting. Plenty of new things to learn here. A photo of one of the many colorful butterflies here. They will even fly or land on you. 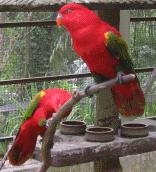 This farm has a Nature Park and the Museum of Asia Artefacts for you to explore and gain an educational knowledge on the world of butterflies, reptiles, insects and art. A souvenir shop at the end of your tour enables you to browse at the many items that you can purchase before leaving the farm. There are lots of information on the signage that explain the various aspects and lifecycle of the butterflies. While you are here, remember to look up for some rare butterflies species such as the Yellow Bird Wing (Troides Helena) and the Indian Leafl (Kallima Paralekta). The other interesting species is the Rajah Brooke's Bird Wing from the Papilionidae family which was discovered in the island of Borneo in the year 1855 by A.R. Wallace. 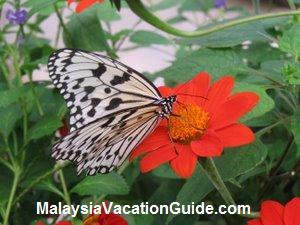 This butterfly was eventually named after the first British Rajah of Sarawak. The typical life cycle of a butterfly can be seen here. It starts with the adult butterfly laying eggs on the leaves of a plant. The eggs than hatched and caterpillars began to feed on the leaves. After a few days of intensive feeding on the leaves, the caterpillar than transformed to become Chrysalis for a few days before full transformation to become adult butterflies. The various stages of the life cycle of the butterflies can be seen here. However, the discovery of the eggs need time and an attentive eyes compared to the caterpillars, chrysalis and butterflies stages. 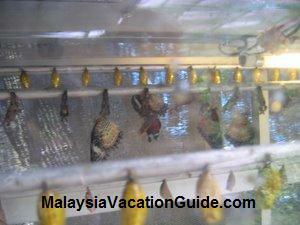 The many species of butterflies chrysalis that are being breed at Penang Butterfly Farm. 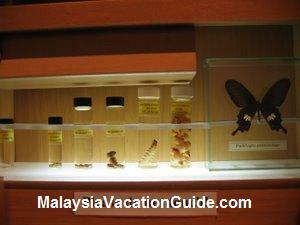 An educational experience at the Museum where specimens of the various life cycle of the butterfly are available for your viewing. 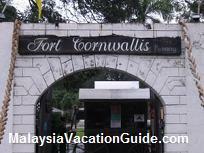 Besides the abundance of butterflies that you can see thriving here, other attractions that have been added include the reptiles, snakes, ducks, tortoises, birds, camouflaged insects, scorpions, a fish pond with big fresh water fishes. 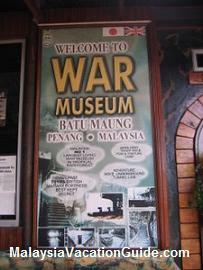 An Insect Museum and a Souvenir Shop round up your visit here. If you are into serious study of butterflies and insects, plan to spend at least 3-4 hours here. Video Camera and Camera: Free Of Charge. 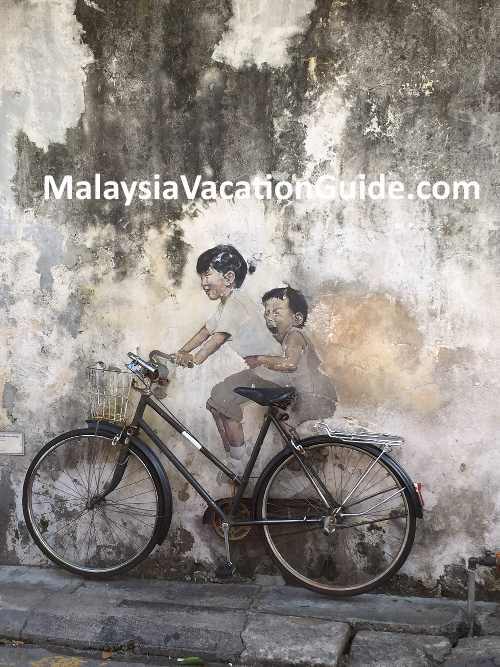 There is a special 33.3% discounts for Malaysians with MyKad. 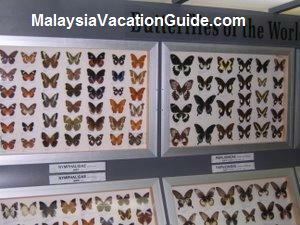 The various type of butterflies from around the world are shown in the Museum. 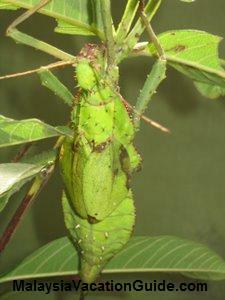 A stick insect that resembles a leaf to camouflage it from danger. You will need to observe carefully to discover it. 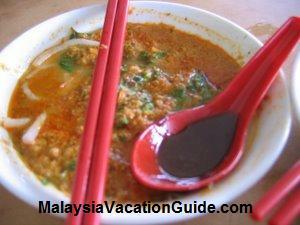 If you are driving from Georgetown, head towards the direction of Batu Ferringhi and then go towards Teluk Bahang. Follow the signages and you should be able to reach this farm within 30 minutes if the roads leading out of the city are not congested.